A huge part of whats makes Santa Barbara the best place to learn to fly, and visit as a pilot is our flying community. The Hang Gliders who started here in the early 1970’s are still here, and continue to make big flights showing us how it’s done. John Greynald a.k.a Little John has nurtured the flying scene here since its inception. His four decades of effort on the flying communities behalf in monumental. His leadership as the sage of our local club the SBSA has bred a healthy culture. We are organized and passionate about having visitors, and we strive to act as ambassadors in our shared goal to have fun flying our range, and protecting our cherished flying sites. A huge thanks to the SBSA Board of Directors. The volunteers on the board give their time to secure our privilege to fly, and organize trips, clinics, festivals, events, and parties. We have more John’s doing good things. The SBSA clubs technical team are both Eaglets (Jon Blake and John McMahon). These guys have absolutely knocked it out of the park with the club website and chat box. Their joint efforts has raised our community awareness of all things flying. The communication tools have enriched our flying scene immensely. Thanks all you John’s. The community has a huge amount of gratitude for your efforts. Community member Aaron LaPlante received a USHPA commendation award after spending countless hours creating materials which educates and inform pilots new and old about the intricacies of staying high and going far while flying the south coast. Aaron is known by his friends in the flying community as “Cracka”. His educational videos are known as his “Cracka Sauce”, and if you haven’t tried any you need to change that right now. Cracka also started the SB Hoedown in 2017. The SB Hoedown gives pilots a chance to fly tasks in our local mountains. These monthly tasks give pilots the opportunity to gain experience flying to designated points, and finally to goal. 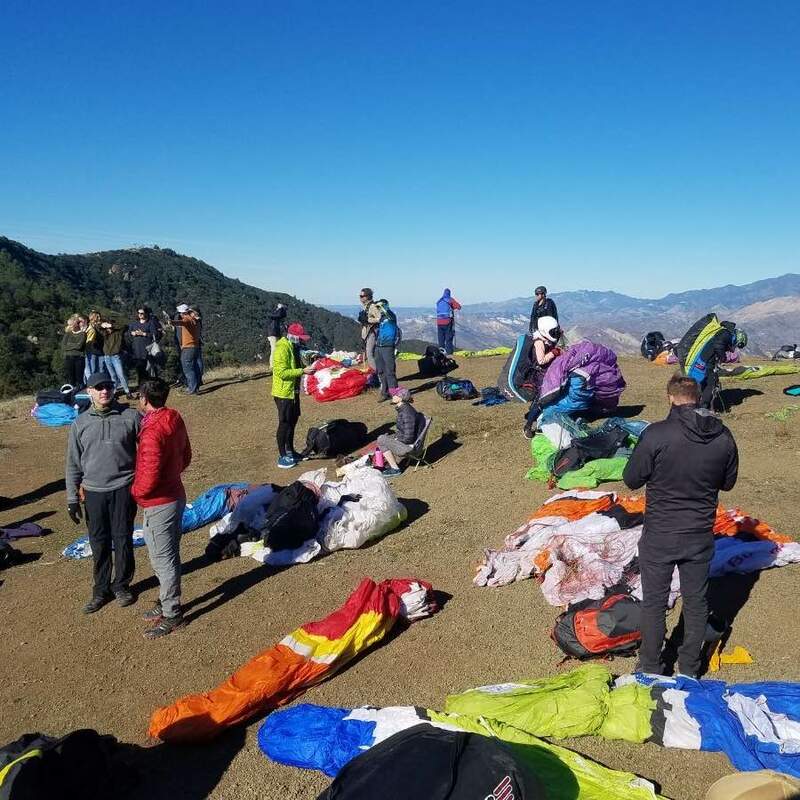 The tasks give pilots experience on all the facets of paragliding racing, and what we can expect to see at paragliding race to goal competitions. Cracka may be enabling our next US champion. Who knows what Cracka has up his sleeve next, but his efforts have made a huge impact on our flying community. Thank you my Cracka! Tom Truax, also known as “Sundowner” has been a huge contributor. Sundowner certified many of us as P2 pilots when he was running his school Skysports. Sundowner has an amazing Flight Log documenting his flights in rich detail. These logs provide a huge educational opportunity for flying the South Coast and our surrounding mountain ranges. Mitch Riley, and Marty DeVietti have also presented at the local club meetings. Their presentations have been educational and entertaining. A huge thanks for the efforts made by all of these guys, and the continued efforts our mentors and instructors make daily. The Eagle Team is a integral part of the community. Mitch Riley is the chief instructor in the mountains, and has a true sense of how to inspire and educate our local pilots and students. The Eagle Van is a staple on the South Coast. You are no stranger to the Eagle Van if you follow the posts on Telegram announcing our meet times for trips up the mountain. We rarely miss a flyable day. The entire Eagle Team works together at various locations simultaneously to get the pilots and students in our community the flying experiences they need to continue to progress and enjoy the sport.